Soft Sleeper 6.5 has found a way to give you the same great sleep surface as a $5,000 visco-elastic foam mattress for a price starting at 94% less the cost of a traditional visco foam mattress that sell at some retailers for over $5,000! There is a revolution going on in bedrooms across the country. The revolution is not between the sheets...it's under them! Visco-Elastic memory foam uses a technology first developed by NASA to make the most comfort sleep surface ever. We have taken that technology and developed a luxurious Soft Sleeper 6.5 next generation material. You may have seen the visco-foam mattress story on TV but the secret is that only the top 2-4 inches of their $5,000 mattress is actually the technologically advanced visco-elastic memory foam. The Soft Sleeper 6.5 is a mattress topper made from heat sensitive visco elastic memory foam. This luxurious material reacts to your body temperature, so the surface stays cool in the summer and warm in the winter. Over 9 out of 10 of our customers report that the contoured surface cradles their body and helps eliminate those pressure points created by traditional mattress surfaces. Another 89% of our customers reported less back and neck pain too. When it comes to buying memory foam mattress toppers, there are many options that need to be considered. Many retailers will offer a variety of mattress densities and thicknesses. We however only offer the softest and most luxurious Soft Sleeper series in 2, 3 and 4 inch thicknesses. We are so sure that our Soft Sleeper 6.5 products will improve the one third of your life that is spent in bed that we will offer you a no questions asked in home trial for 30 nights. If you are not sleeping significantly better and waking refreshed, send the mattress topper back for a full refund of the purchase price. 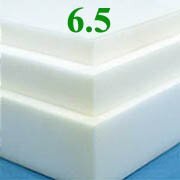 Soft Sleeper 6.5 memory foam products will improve the one third of your life that is spent in bed. View More In Mattress Toppers. If you have any questions about this product by Soft Sleeper Visco Elastic Memory Foam, contact us by completing and submitting the form below. If you are looking for a specif part number, please include it with your message.